Now that we have worked out our syntax for our powershell scripts, we need to add them to some scheduled tasks to run them out of normal business hours – or just to automate them so you don’t have to do it manually. In Part 1 we covered which commands we are going to run if you missed that, you can find it here. You will need to have these commands saved as powershell scripts, (.ps1 files) you can do that by simply putting the syntax into notepad and saving the file with the .ps1 extension. To add them to a scheduled task is slightly different than running your average batch file, it even has a little more complexity than running a normal powershell script, because for exchange cmdlets to run, you have to load the exchange powershell snapin as part of your scheduled task. You can find a lot of useful info out on the net, some of the most useful posts i found are linked at the end of this article. Switch to the ‘Triggers’ tab, and click on New. Here you can define the schedule that the task will run to, i would suggest you gauge the length of time the task takes to run, so you know how much time you need to run the task to minimise any disruption or performance issues. Click on OK. You can see your trigger defined. Now click on the ‘Actions’ tab and click ‘New’. 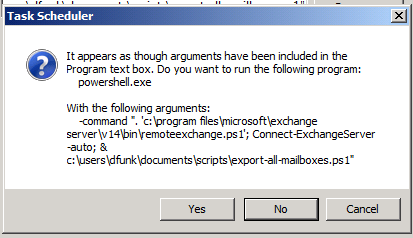 PowerShell.exe -command ". 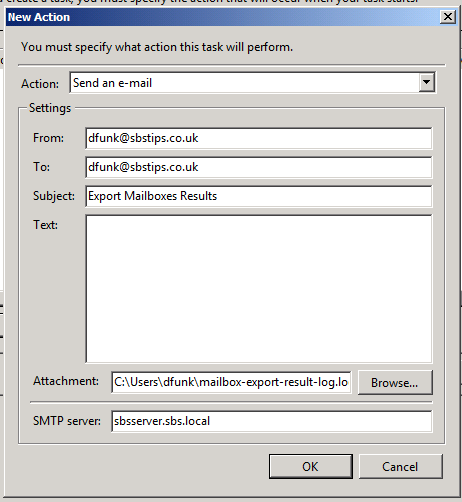 ‘c:\Program Files\Microsoft\Exchange Server\V14\bin\RemoteExchange.ps1’; Connect-ExchangeServer -auto; & C:\users\dfunk\documents\scripts\export-all-mailboxes.ps1"
Click on OK to save this syntax. 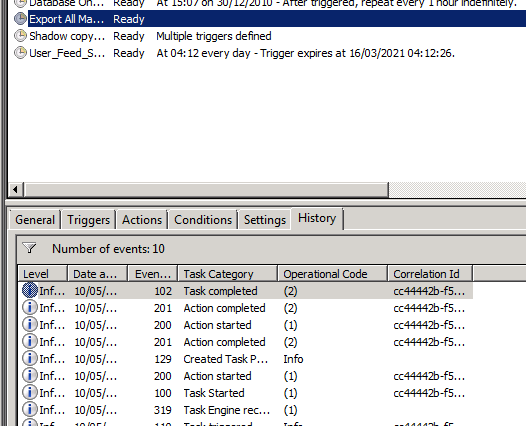 You are prompted because the task scheduler detects arguments to run with your command, click yes here. 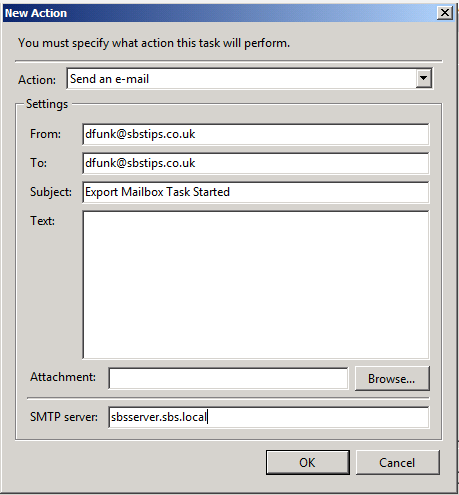 Click on New again, to add a second action, which is to send an email. Choose ‘Send an e-mail’ from the dropdown menu. Fill out the details that are relevant to your environment. Click on OK, and then click on OK again to save your task. You will be prompted for your password as we are allowing this task to run if a user is logged on or not. 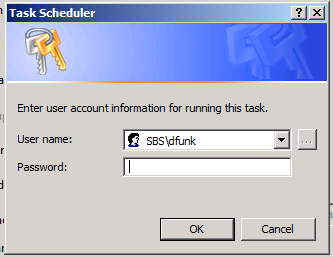 Enter your password and click ok, and you be returned to the task scheduler. You will see your new task added. 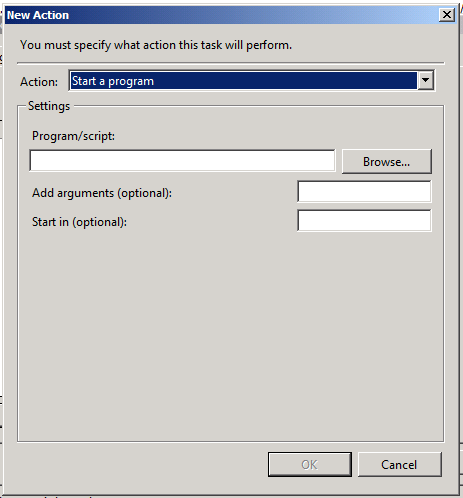 Right click the task, and choose ‘Run’ to test your task. You can see both actions have completed. Now, let’s check we have a log file created..
Not a particularly inspiring email it has to be said, but it does tell us that our task has kicked off. 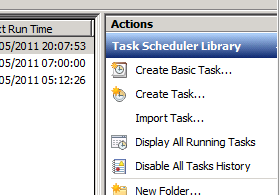 Now, we can add a second scheduled task to run our second powershell script. This script will be almost identical but we will be running our powershell script to check on the status of the exports. 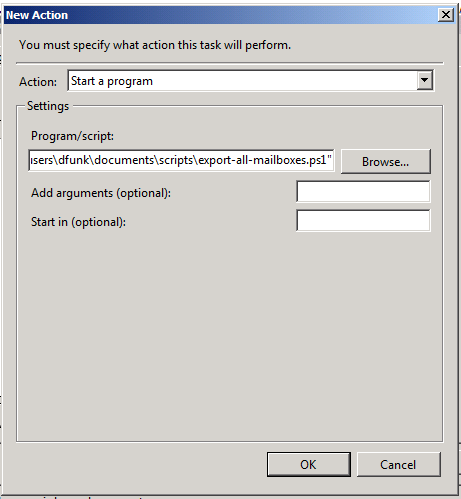 With this task you can also add an attachment to the email action, which is the output log file of the powershell script. 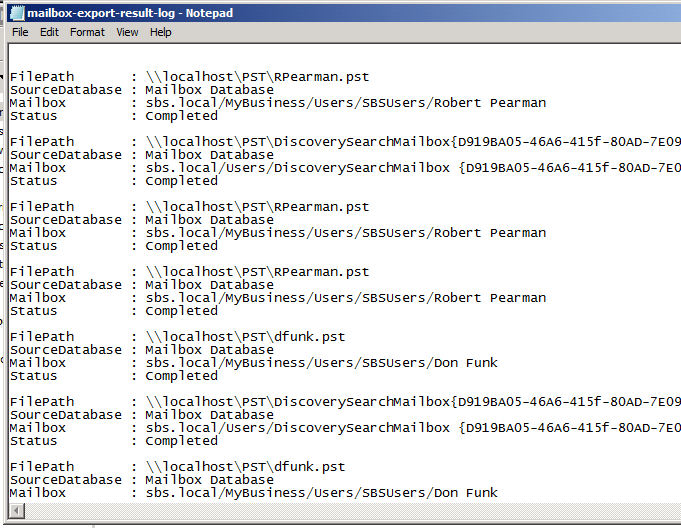 This command will output the status of the exports to the c:\users\admin\mailbox-export-result-log.log. Your email should look something like this..
Now, the final task to add, is our final script. This should be run as the final script, after your results email has arrived to clear the logs for the next time the tasks are run. 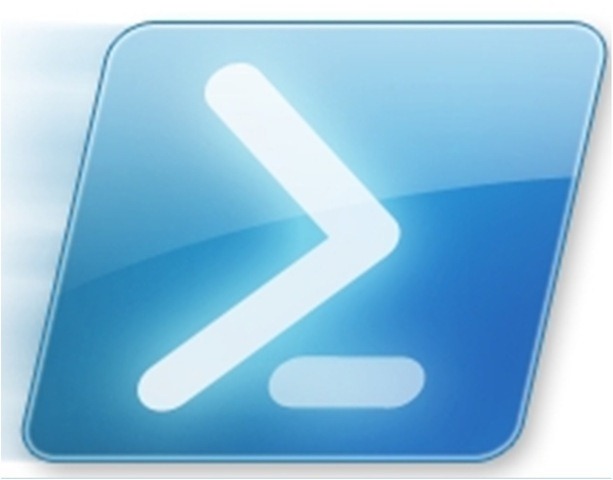 I used the following links to pull this info together as well as the built-in powershell help. So it looks like Wayne and Gagan beat me to posting the steps to exporting mailboxes out to PST files, the same functionality we used ExMerge for in the 2003 era, however something they didn’t publish was how to schedule it. So before they do, i thought i would have a go. Firstly to make it quicker for me to publish and increase the likelihood of beating them to it, i will assume you have read their awesome guide here.. So following on from them, let’s assume you want to schedule this to run each night, or weekly as a compliment to your already ‘robust’ backup routine, which i am sure is the corner stone of your foolproof disaster recovery plan. Let’s examine the commands we need to run. This command will execute to export all mailboxes on the server, and save them to a share called PST, inside which the mailboxes will be named alias.pst, from the screen shot below you can see my 3 mailboxes..
Now we are going to be scheduling this, so we wont be running it interactively, but we will want a log of what has occurred right? so let’s append some text to our powershell command..
After a few seconds we are returned to a prompt..
Let’s open up the resulting file and see what we have got. The resulting output is not really very friendly for a log file – yes we can see the exports are queued and we dont have any errors but it might be better if we could format the output a little neater. If we change the syntax again slightly to include ‘format-list’ (fl for short) the output changes greatly. Now this is probably too much information to review for a log file, so we now might want to narrow down what we are going to report. Let’s now add some more syntax to our command, this goes in before we put the ‘format-list’ command or Fl for short. This is much more manageable – we can see the path to the exported PST, we can see the source database (if we need it, if you are running more than one database) the actual mailbox and the request’s status. 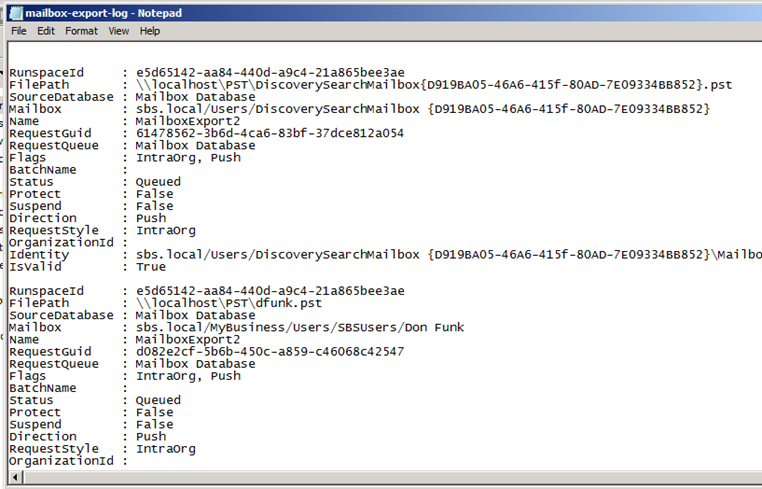 What we can do now is run a second command to pull our results into a second log file. Hmm hold on – this is showing me EVERY mailbox export request ever. This is not ideal because our log file is going to be huge. As written in Wayne and Gagan’s article we can run this command to clean things up.. If i press A to get rid of all the reports i am sent back to a PS prompt. Now if i run my report again, i should get an empty log, because there are no mailbox export requests left on the system. So, the next time we run our export this log will be populated only with those particular export statistics, and in turn can be cleaned out by running the remove command. 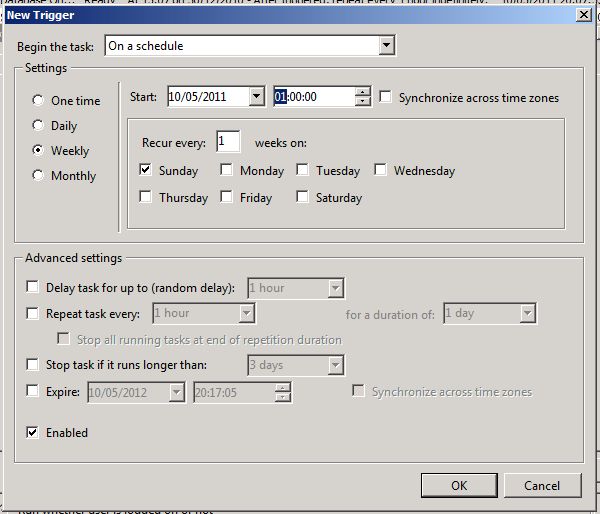 In the next part of this article i will show you how to turn this into a scheduled task.